He followed up his :48 2/5 half-mile work with a solid five-eighths drill in 1:01, third fastest of 28 works at the distance. The Champagne form took a bit of a hit with the defeats of Firenze Fire and Enticed in the Holy Bull Stakes, but he’s come a long way since then even though he’s only run once. He is the champ and they still have to knock him off his throne. Like many early Derby favorites in recent years, there is little to do but monitor his works and wait for his 3-year-old debut, which will be the first of only two Kentucky Derby preps, bringing him into the Derby with five career starts, four of them at a mile or longer. As dominant as he was in the Breeders’ Cup Juvenile, we really don’t have an extensive resume to go by, so we have no idea how good he really is, other than he has showed a maturity far beyond his years and experience. So far, it’s been sort of a whirlwind career, as brief as it is. We will have a more definitive picture after the Fountain of Youth Stakes. His connections had to be happy with his solid half-mile work in :48 2/5. This was a very smooth easy work. He was striding out beautifully in the stretch, with the rider’s hands motionless, and galloped out strong in 1:01. With two works under his belt since suffering a pulled muscle, he is on course for his delayed debut the San Felipe Stakes. Ruis said he was “super happy” with the work. It was an interesting move securing the services of Javier Castellano, who rides Instilled Regard and Mask, and now Holy Bull winner Audible. Some big decisions forthcoming from that camp. For now, Bolt d’Oro looks to be in excellent flesh, as Ruis adjusts to the altering of his original schedule and going with the two starts instead of getting in that sharpener in the 7-furlong San Vicente Stakes. At least the Remsen Stakes form held up very well with the victory by runner-up Avery Island in the 1 1/8-mile Withers Stakes. Avery Island now has impressive scores in two graded stakes, sandwiching a decisive defeat at the hands of Catholic Boy, so there’s no doubt Catholic Boy has a great deal of upside, and we will find out how much when he faces what looks to be a tough field in next Saturday’s Sam F. Davis Stakes, which will be his first of two scheduled starts before the Kentucky Derby. He shipped to Tampa last week for a strong 5-furlong breeze in 1:01 and returned on Sunday to breeze a half in :49 1/5, so he seems to handle that quirky surface pretty well. He will get a good test on Saturday, facing the likes of Hollywood Star and one or two Pletcher hotshots. With the January 6 Sham Stakes under his belt following a hard race in the Los Alamitos Futurity in December, Baffert has the luxury of now taking his time with him, and he gave him a leisurely half-mile breeze in :49 2/5. Baffert, as is his custom, would not commit to any race, simply saying there are a lot of options. McKinzie broke off 2 lengths behind workmate Downtowner, closed in at the quarter pole, taking the turn into the stretch a bit wide. He was under no pressure in the stretch, and was nudged along slightly approaching the wire to finish on even terms, with Downtowner, who looked darn good himself in the stretch, galloping out just a bit stronger of the two. Everything about this colt spells racehorse, as he seems to do things the right way. In his 5-furlong work in 1:01 4/5, he did everything on his own, with the rider having a nice loose rein down the stretch and never asking him. His lead change was as smooth as can be, and all in all this was an excellent work with a very strong gallop-out. We’ll see if Hollendorfer sends him back to Fair Grounds for the Risen Star Stakes or keeps him home to point for the San Felipe, which is looking like a very tough race, with the return of Bolt d’Oro and likely either McKinzie or Solomini from the Baffert barn. Just a note, three of his first five dams won or placed in grade 1 or grade 1 equivalent stakes. There is nothing not to like about this colt, who is making strides with every race. Glad to see him return to the work tab with a solid half-mile drill in :48 3/5 in company. It wasn’t the smoothest of works, as he needed help from the rider to switch leads and it took him a few strides to get his head straightened out and level off. He was being pushed along in the final furlong, finishing a head behind his workmate, who was a bit stronger on the gallop-out. But for his first work back following an illness and missed training, this was at least a step in the right direction, and we should see a smoother work next time. As I have mentioned, I just don’t know what his strengths are. He obviously was better catching horses in the stretch in the Los Alamitos Futurity than he was with a clear lead at the head of stretch in the BC Juvenile. But with his steady, grinding style of running I would like to see what he can do going to for the lead at the start and controlling the pace or just take back and make one late run, as he did at Los Al. I doubt his closing kick can match that of Bolt d’Oro, but he is an honest, classy colt, who despite running in three grade 1 stakes already, still has a good deal of maturing and improvement left in him. But it’s time to start showing it and for Baffert to find out just what his strengths are. The natural reaction to his freaky performance in the Holy Bull Stakes is to place him high up in the rankings. As impressive as it was, we have seen this before with Pletcher horses in January and February at Gulfstream, and this colt has a miler’s pedigree on top, and is out of a mare by a sprinting sire. The short stretch and the Gulfstream track was to his benefit, and horses who run out of their skull and go that fast this early usually are peaking too soon. It would not be a surprise to see them skip the Fountain of Youth and wait for the Florida Derby to give him enough time to recover from this big a performance. And it was big, coming home in :23 4/5 and :06 flat and crushing three top-class colts, who have excelled in grade 1 and grade 2 races. But it must also be noted that looking at the Thoro-Graph numbers, none of these horses were particularly fast going into the race, with Audible’s last start just a hair faster than any of the others, despite their success in graded stakes. However, with Audible coming off an easy score against only three overmatched opponents at odds of 1-5 in allowance company, no one was expecting him to beat highly ranked Tiz Mischief and Enticed by 13 1/4 lengths and 14 3/4 lengths, respectively, or even grade 1 winner Free Drop Billy by 5 1/2 lengths. For that reason I still want to know if Audible is that good or are the others not as good as first thought. .As for his pedigree, he does have Belmont winner Easy Goer and Alabama winner Classy Cathy in his fourth generation, but can they provide enough stamina to overcome Into Mischief, Gilded Time, Timeless Moment, and Gulch – all sprint or mile influences – in his first three generations? Under the circumstances, I thought his performance in the Holy Bull was excellent for his 3-year-old debut and bouncing back from a poor effort in the Breeders’ Cup Juvenile. He was aggressive enough early to get a good position, made a good move to challenge for the lead, but simply could not match strides with Audible, who totally freaked. But the fact that he finished 7 3/4 lengths ahead of Tiz Mischief and 9 1/4 lengths ahead of 9-5 favorite Enticed was encouraging enough to feel he ran a bang-up race and is only going to improve off this effort. And remember, he is bred to run all day. If you like to see the John Nerud touch in a horse’s pedigree, his second dam, grade 1 winner Serape, is a half-sister to the Nerud-bred Cozzene, and Serape is by the Nerud-bred Fappiano, out of the Nerud-bred Mochila, second in the Beldame and Ruffian. If you still follow Dosage, his Dosage Index is a stamina heavy 1.74. So, all in all, this was a very encouraging 3-year-old debut. The question whether he is fast enough to compete with the best. Still not so sure how he ranks with stablemate Enticed, considering the strange nature of the Holy Bull, but there is no denying he is a consistent, classy horse. His Withers score was more workmanlike than anything, and the only factor preventing him from being ranked higher is the :39 3/5 final three-eighths and :13 3/5 final eighth. It was difficult to get a good gauge on the racetrack because of all the sprints, but it didn’t seem as if the track was playing incredibly slow, with allowance horses running a fast 6 1/2 furlongs the race before. But you can’t get too hung up on time, especially at Aqueduct, and if you look at his Nashua and Withers victories, and even his well-beaten second to third-ranked Catholic Boy, as well as his strong pedigree, you have consider him a legitimate Derby contender. His tail-female family is from Chile, with his second dam winning the Chilean St. Leger and a number of other stakes before coming to America and winning a pair of grade 3 stakes. No reason not to put him back after the inconclusive results of this past weekend’s races and his dominating victory over a pair of talented Steve Asmussen-trained colts in the Smarty Jones Stakes, in which he came home his final eighth in a swift :12 1/5. I loved his last 6-furlong work in 1:12 3/5, in which he broke a length off his workmate, cut the corner beautifully, and was smooth as silk down the stretch with no urging. He had excellent extension coming to the wire, finishing a half-length in front, and was 8 lengths clear on the gallop-out by the time he went into the clubhouse turn. He does have several speed influences in his female family and his half-sister Sandy’s surprise won the 1 1/16-mile Zia Park Oaks. But there is stamia as well, and so far he has shown no indication he doesn’t want to go long. Scratched from the Holy Bull Stakes, he will get his chance to better stablemate Free Drop Billy’s debut when he takes on Catholic Boy in the February 10 Sam F. Davis Stakes. If any horse is eligible to show big improvement from 2 to 3 it is this colt, who seems to have matured mentally, while filling into his frame. He turned in another sharp work, breezing 5 furlongs in 1:00 2/5. I like he way he’s been training and the way he and Free Drop Billy worked in company last week. Like Free Drop Billy, I am tossing his BC Juvenile, in which he broke from the 12-post, and focusing more on his strong second-place finishes in the Saratoga Special and Iroquois Stakes. He also made a great impression training for the Breeders’ Cup, despite seeming a big green. So, if he has indeed matured into a professional racehorse, he should run well enough at Tampa to move forward. But like Free Drop Billy, he needs to get faster, as we have seen how important speed is now in the Derby. Lowered him a few spots from last week only because of the slow final three-eighths of the Withers Stakes, but with only a five-horse field, drawing the rail, being closer to the pace than he wants to be, going 1 1/8 miles, and coming back in only three weeks, I will excuse him for failing to catch Avery Island, and I thought he was striding out very well in the stretch. There is still a major question mark whether he is as effective going this far, but he has built up an impressive enough resume in five stakes races to at least keep him relevant for the time being. Now we’ll see if they shorten him back up for the Gotham Stakes to sharpen him for the Wood Memorial. He may or may not be Derby material, but any trainer would love having him in their barn. It’s not going to take much to see several changes in the Top 12 in the near future, as a second wave of seemingly faster horses arrive on the scene, combined with several of last year’s stars possibly being exposed after regressing off their 2-year-old form. This past weekend saw an assault of 3-year-olds, from two-turn stakes horses, sprint stakes horses, and grass stakes horses to two-turn allowance horses and two-turn and one-turn maidens, several of whom ran off the chart. If given a guarantee that the Kentucky Derby winner was seen in action, I would be inclined to pass up the four stakes and predict that horse was allowance winner TITLE READY, based on everything I saw and the overall impression he left. 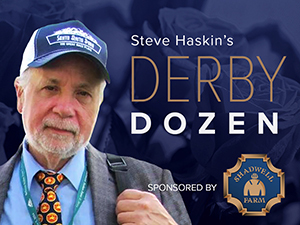 As reported last week, Steve Asmussen is loaded with potential Derby horses, and I mentioned 10 of them who looked to have the potential to be serious horses on the Derby trail. Those 10 are based at both at Fair Grounds and Oaklawn Park. On Feb. 1, Asmussen sent out two of them in a salty allowance race at Oaklawn and had to feel good about the result, winning with Title Ready and just missing second with the late-closing DREAM BABY DREAM. As for Title Ready, I loved everything I saw, and there is no doubt this son of More Than Ready is indeed more than ready to make a name for himself in stakes company. Asmussen added blinkers following an even third in an allowance race, and it seems to have really turned him around. He broke sharply, and raced off the flank of Wayne Lukas’ highly regarded 4-5 favorite TRANSGRESS, with another horse lapped on him on the outside. So while he was putting pressure on the favorite, a longshot was putting pressure on him. Heading around the far turn, when jockey Luis Contreras gave him his head, he moved up to challenge Transgress and the two matched strides to the quarter pole. The only difference, and this was the key, Transgress was under a full-out drive with his ears pinned back, while Title Ready had his ears up with Contreras looking back under his right arm, as if he knew he had the favorite measured. Title Ready changed leads on cue turning for home and began to ease clear of Transgress, eventually drawing away with smooth, efficient strides to win by 3 1/2 lengths, coming home his final sixteenth in :06 2/5. I just wish Contreras hadn’t hit him 15 times in the stretch, five times after he had opened a three-length lead. But other than that, he gave him a flawless ride, and Title Ready did not show any signs that the race took much out of him. He has now finished on the board in all five of his career starts – at 5 1/2 furlongs, 6 furlongs, 7 furlongs, one mile, and 1 1/16 miles. Now that is progression. Pedigree-wise, More Than Ready is more than capable of siring a classic horse with the right female family, and Title Ready certainly has that. His broodmare sire, Monarchos, ran the second-fastest Kentucky Derby in history, behind only Secretariat, and is the only other Derby winner in addition to Big Red to break 2:00 in the Derby. Title Ready’s second dam is the undefeated Hall of Famer Personal Ensign. The tail-female family has a solid Argentinian foundation, tracing to Aristophenes, sire of Argentina’s Horse of the Year and Triple Crown winner Forli, sire of the great Forego. I love the presence of full-sisters Hall of Famer Numbered Account, dam of grade 1 winners Dance Number (dam of Travers and BC Juvenile winner Rhythm) and Private Account (sire of champions Personal Ensign and Inside Information); and Playmate, dam of Woodman (sire of dual classic winner Hansel) in the sire and dam’s family, which means Title Ready is inbred top and bottom to their sire and dam, Buckpasser and Intriguing. So, all in all, there is nothing at all not to like about this colt, who seems to have the tools and the pedigree to be a major force on the Derby trail. I can’t wait to see him tackle stakes competition next time out. This is the time to get him if you’re making future book bets. Asmussen’s other starter in that race, Dream Baby Dream,, ran an excellent race, closing fastest of all to finish third, making up three lengths in the final furlong, and falling a head short of catching PLAINSMAN for second. I was anxious to see how CATDADDY ran, coming off one of the strongest allowance races of the year, in which he finished a game third behind Higher Power and New York Central. But the son of Munnings was fidgety in the gate was backing up when the latch was sprung, causing him to basically miss the break and drop farther back than he wants to be. Then he was shoved some six-wide going into the first turn, and that was pretty much it for him, as he failed to threaten. We’re not finished with Asmussen and Title Ready. That brings us to a 6-furlong maiden race at Oaklawn Saturday. The Asmussen-trained MITOLE was made the 2-5 favorite, based on a close second to the above mentioned Transgress, who had finished second to the highly ranked Holy Bull runner-up Free Drop Billy in his career debut before defeating Mitole, who finished almost 11 lengths ahead of the third horse. Well, all Mitole did in Saturday’s 6-furlong maiden race was win by 10 lengths in a sizzling 1:09 3/5, untouched by the whip, and galloping out in another area code. So, looking at the connection, there is no doubt that Title Ready defeated a very talented horse in Transgress, and the way Mitole, a son of Eskendereya, demolished his field and was striding out at the end of Saturday’s race, it looks as if Transgress had also defeated a very talented horse. Did you get all that? Mitole’s dam, Indian Miss, is a half-sister to Live Lively, winner of the 1 1/16-mile Davona Dale Stakes and second in the 1 1/8-mile Gulfstream Park Oaks before suffering a fatal injury while training at Belmont Park. Indian Miss’s dam, Glacken’s Gal, a daughter of champion sprinter Smoke Glacken, was fast 2-year-old, winning the 5-furlong Astoria Stakes, after which she was injured in training and retired after only two starts. With Eskendereya on top, Mitole could stretch out successfully, but who knows how far, and he is still has a lot of catching up to do..
Another race of great interest was Friday’s maiden race featuring RESTORING HOPE, making his third career start. Sent off at 4-5 in the 1 1/16-mile race, he outran speed and went to the lead before his stablemate LONGDEN, breaking from the rail, overtook him going into the first turn. Restoring Hope was keen to go on and moved up to challenge down the backstretch before settling into a comfortable position, a half-length off the leader. He engaged Longden, but his stablemate was not giving up without a fight. Restoring Hope finally inched clear inside the eighth pole and steadily drew off to win by 3 1/2 lengths. But Flavien Prat had to ask him, and considering the final fractions of :26 and :06 4/5, I still need to see more. This was a good effort, but he will have to step it up a notch when he meets far better competition. As for Saturday’s stakes action, I did not put anyone from the Robert B. Lewis Stakes in the Top 12, simply because no one did anything worthy of such a high ranking. The wire-to-wire 2-length winner, LOMBO is a very fast and improving son of Graydar, and the runner-up AYACARA had a perfect ground-saving trip and ran well enough to finish a clear second; and looks to have a great deal of scope for improvement. I can ignore the slow final time of 1:45 2/5 for the 1 1/16 miles, but those last two fractions of :26 and :07 just doesn’t cut it, and we have to see a lot more from these horses to think they can hold their own against the likes of fellow Californians Bolt d’Oro, McKinzie, Instilled Regard, an Solomini. The big disappointments in the race were the pair of 2-1 shots PEACE and SHIVERMETIMBERS, who both came up empty. Getting back to the Holy Bull Stakes, I have to admit I was extremely surprised to see both TIZ MISCHIEF and ENTICED run such flat races and finish more than 10 lengths behind Audible. So, either the Kentucky Jockey Club Stakes form was poor or this was such a freaky race that it warrants giving both colts another chance. Could such astute horsemen as Dale Romans and Kiaran McLaughlin be that wrong about a horse? I have no idea where we stand with them. In the Withers, I actually thought MARCONI ran a good race and have not given up on him by any means. But he showed he still has trouble breaking sharply from the gate and is still a bit green, the way he ran down the stretch. He has a lot to learn, but my main concern is that with three 1 1/8-mile races in three career starts, he could be dulled by all those long races, especially considering he has a few issues he needs to work out. One would think the flat mile of the Gotham would at least sharpen him up, and he certainly does not need to win that race, coming off all those long slow races. Even if he runs well and shows some maturity, the one-turn mile could have him primed for a big effort in the Wood Memorial and give him an all-important fifth career start going into the Derby, considering the poor record of horses with only four starts. If there was a Derby horse to come out of the 7-furlong Swale Stakes, one would think it is runner-up GOTTA GO, who came flying from last in the stretch. The son of Shanghai Bobby was way up the track in the Kentucky Jockey Club Stakes, but before that defeated LONE SAILOR and BRAVAZO in the Street Sense Stakes in a gutsy effort. He could be a one-turn closer, and we’ll find out soon enough. The winner, STRIKE POWER, ran a super race outrunning the swift TRICKS TO DOO and maintaining his lead through the final furlong to win by 2 3/4 lengths in 1:22 3/5. But he is a son of Speightstown, is pure speed, and this was only the second start of his career, so we can’t really look at him as a Derby horse until he stretches out to two turns. He at least has made good progress, going from an 8-length winner at 5 1/2 furlongs to a stakes winner at 7 furlongs, and he does have some stamina influences in his female family, such as broodmare sire Medaglia d’Oro and Theatrical. And to demonstrate the versatility in the family, his third dam, Golden Treat, was fast enough to set a track record at 4 1/2 furlongs at Hollywood Park, but classy enough to win the Santa Anita Oaks and place in the Fantasy and Las Virgenes Stakes. I will also keep an eye on third-place finisher DIAMOND KING, who had a rough trip, breaking slowly and having to steady behind horses. He should be stretching out in his next start, but as of now, he may be considered more of a Preakness horse by his connections, Cash is King Stable and John Servis. Also at Gulfstream Saturday was the Dania Beach Stakes on grass. We know by now that UNTAMED DOMAIN likely will be headed for the dirt in his next start, and this looked to be an excellent prep, and not a race trainer Graham Motion was going to knock him out trying hard to win. He dropped some 8 lengths behind the pace-setting Gidu, who was being chased by eventual winner Speed Franco. Both colts were strong in the stretch, and Untamed Doman did well to rally for third, finishing 2 3/4 lengths behind the dueling winner and runner-up and 4 1/2 lengths ahead of the fourth horse. So if he handles the dirt, he could an interesting horse to keep an eye on. There is one unlikely stakes race I need to catch up on, only because of how impressive the winner, RUNAWAY GHOST, was in the Riley Allison Futurity at Sunland Park. He was passed by three horses down the backstretch, then made another move, only to be passed again by two horses. But when asked for a third time, he bounded away impressively to win by 7 3/4 lengths in a sprightly 1:40 3/5 for the 1 1/16 miles, coming home his final quarter in :24 flat and shading :12 for the final eighth. He was very impressive visually and was striding out strongly in the final furlong. He had been well beaten in the Los Alamitos Futurity after battling on the lead through rapid fractions, but before that, romped by 7 1/2 lengths over the Tapeta surface at Gold Gate in the Golden Nugget Stakes. There were three other races over the weekend worth mentioning. The Mark Casse-trained MISSISSIPPI, a $700,000 2-year-old by Pioneerof the Nile who was a close second to the highly regarded NOBLE INDY in an allowance, was scratched from the Holy Bull after drawing the outside post and ran instead in a 1 1/16-mile allowance race the following day. Sent off at 4-5, he saved ground most of the way and rallied along the inside, only to miss catching STORM RUNNER by a neck, while making up three lengths in the stretch and finishing 9 1/4 lengths ahead of the third-place finisher. The winner, with three grass races under him, despite a handy win and a strong second in his only two dirt races, moved up steadily along the rail, blew by the pacesetting COVE BLUE at the three-eighths pole and drifted a bit wide turning for home, as 8-5 second choice NAVISTAR ducked out to the middle of the track. He opened a clear lead in the stretch, but was carrying his head high and was stuck on his left lead, drifting in near the eighth pole. He held on to win by a neck in 1:42 2/5, which was only three-fifths slower than Audible ran in the Holy Bull. If he can get his act together and race more professionally, he could be an interesting horse to watch, as could Mississippi. It is worth noting that Storm Runner, purchased for a paltry $5,000 as a yearling, has a very strong tail-female family with several Calumet Farm influences. His third dam is by Arts and Letters’ classic-winning son Codex and is a half-sister to grade 1 winner Life’s Hope, who won or placed in 22 stakes from ages 3 to 8. Storm Runner’s fourth dam is by Calumet’s Kentucky Derby and Preakness winner Tim Tam, and his fifth dam is the granddam of the great international star Trillion. He gives trainer Dale Romans yet another potential Derby horse. A couple of impressive maiden sprint winners to watch for down the road are MACHISMO, an 11 1/2-length winner at Gulfstream, going the 6 1/2 furlongs in a sharp 1:16 1/5, and the Bob Baffert-trained CURLY’S ROCKET, who battled head and head early before drawing off to a 3 1/4-length victory. Machismo’s victory moves up the Pletcher-trained MAGNUM MOON, who defeated Machismo by 7 1/2 lengths in his career debut going 6 furlongs in a sprightly 1:10 flat on January 13. However, Machismo has four starts under him, including one on the grass, so he is way ahead of Magnum Moon as far as experience. He, like Catholic Boy, is by More Than Ready, and also has a ton of stamina throughout his female family, including inbreeding to the great mare No Class, dam of $3.3 million earner Sky Classic and Canadian Oaks winner Classy ‘N Smart, dam of Smart Strike, so you have the Rasmussen Factor (RF) on the dam’s side. It will be interesting to see if they start stretching him out after four sprint races. Also, at Oaklawn, Classic Empire’s half-brother, EXCLAMATION POINT, won his career debut, going wire-to-wire, scoring by 2 1/2 lengths in 1:10 3/5 for trainer Brad Cox. The plan is to stretch him out, but obviously he is way behind as far as the Derby. Checking this week’s works, two of Steve Asmussen’s big guns, PRINCIPE GUILHERME and COPPER BULLET, were on the worktab, with the former breezing 5 furlongs in 1:01 2/5 and Copper Bullet remaining sharp with a 1:00 4/5 drill. Asmussen also worked NEW YORK CENTRAL and COMBATANT 5 furlongs in company in 1:01 2/5. Wayne Lukas is getting a good foundation into SPORTING CHANCE for his return in the Southwest Stakes, working the Hopeful winner 6 furlongs in 1:13 4/5. Several other works of note at Santa Anita were the 5-furlong drill in 1:00 4/5 by impressive maiden winner KRIS’ ROCKET KAT and the 5-furlongs works by the speedy Baffert pair of NERO (1:00 2/5) and AX MAN (1:00 3/5). Dale Romans worked his Jerome Stakes runner-up SEVEN TRUMPETS 5 furlongs in 1:00 4/5. One horse in whom there is a great deal of interest, MONTAUK, hit the worktab, breezing a leisurely half in :51. Also working for Pletcher was hot Derby prospect NOBLE INDY, who breezed a half in :48 4/5. I was planning on profiling a horse I like a lot, HIGHER POWER, this week, but with so much action I thought it would be better to hold off for another week or two and see how he is doing after missing several days of training with a fever that could force him to miss the Southwest Stakes. Trainer Donnie von Hemel said he will see how things progress in the next few weeks. So his status is up in the air right now. I am looking forward to putting MASK back in the top 12, but there is nothing to do for now but wait for him to return to the worktab and see what Chad Brown’s plans are for him. On the list of 3-year-olds who have not competed in stakes company yet, but have run big going two turns and look to be on the verge of breaking out and becoming leading contenders are the aforementioned TITLE READY, VINO ROSSO, who was featured last week, the aforementioned HIGHER POWER, as well as RETIREMENT FUND, NEW YORK CENTRAL, RESTORING HOPE, TIZ OUR TURN, and NOBLE INDY, just to name a few.